Erm, just a bit of American history for you. Independence day is the day that the declaration of independence was signed. Not the day we won the war. It was the day that smart, civilized people decided to break free from England. Who don't know what they're celebrating. 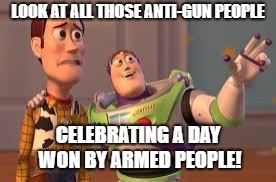 LOOK AT ALL THOSE ANTI-GUN PEOPLE; CELEBRATING A DAY WON BY ARMED PEOPLE!